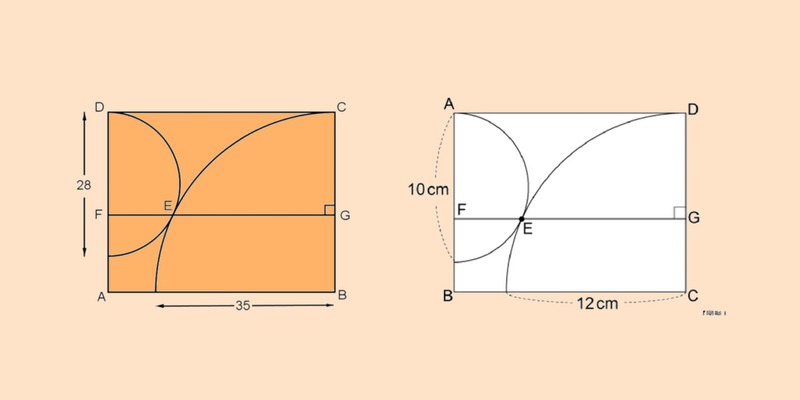 I was spiked to write this post by this tweet from @HenkReuling, mathematics teacher at Liemers College in the Netherlands (visit his web page here), where he posed the lovely little problem shown on the left in orange below — inspired by this problem, possibly, shown on the right in white below, one of many such problems created by @sansu_seijin. 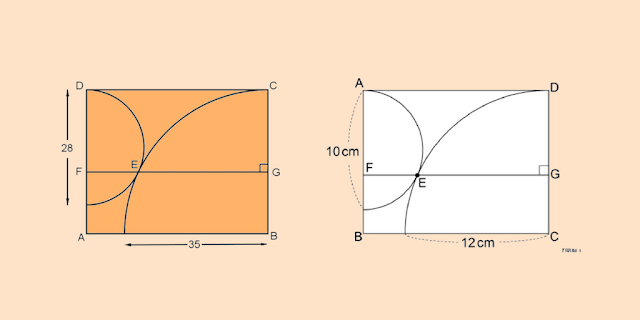 We are asked to find the area of rectangle ABCD, given a semi-circle and a quarter-circle. 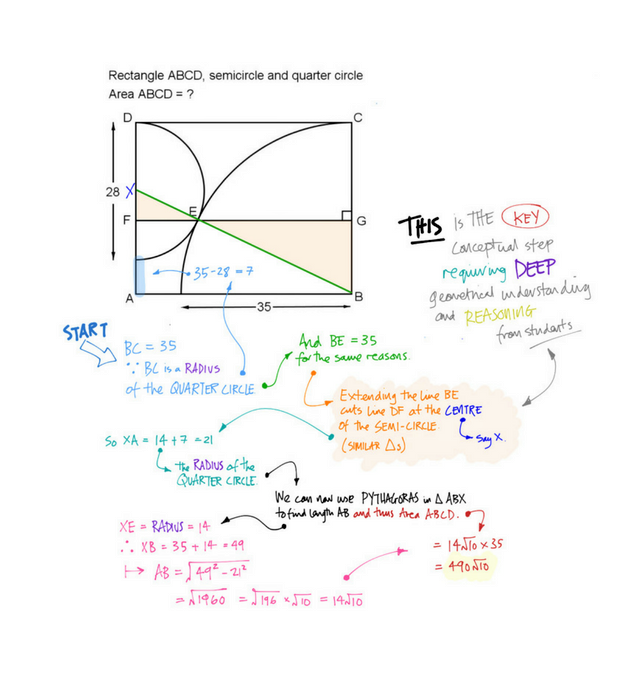 These geometric problems — and their like — demand the kind of interrogative depth from secondary (11-16) students that is necessary for, and that encourages, their mathematical maturation. 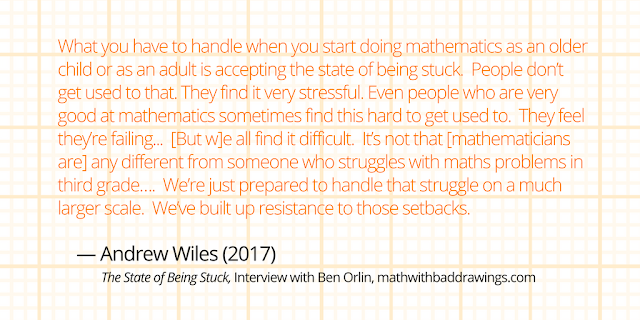 They invoke many of the pedagogical conditions I contend we need to concern ourselves with if, indeed, we are concerned about supporting the development of our students' mathematical maturity. As, indeed, we should be. But it is important to recognise that such problems will only ever engage this (mathematical) maturation process if we as teachers, as custodians of the knowledge underpinning them, approach and guide our students' interactions with them carefully, sensitively and with intellectual, emotional and pedagogical humility. In any other such philosophical hands, these problems have the potential to be more than mere missed opportunities, they can undermine the very effects that their design aims — and has the potential — to produce, posing a real and equally as potent threat to a student's mathematical maturation. Yes, 'we need to design learning that involves students making meaning,' as David Geurin succinctly puts it, rather than 'just accepting information' (see his blog post here), but here I am also arguing that we need to give as much thought to the design of our teaching to such problems — our interactions with students, how we guide students' own interactions with the problem, what we will say to them and what we will and will not tell them, how we will say what and at what point in the process we will or won't say it — just as much if not more than the thought we give to the design of the problems themselves, or, indeed, the thought we put into what students will do, as if the doing alone equates to learning. 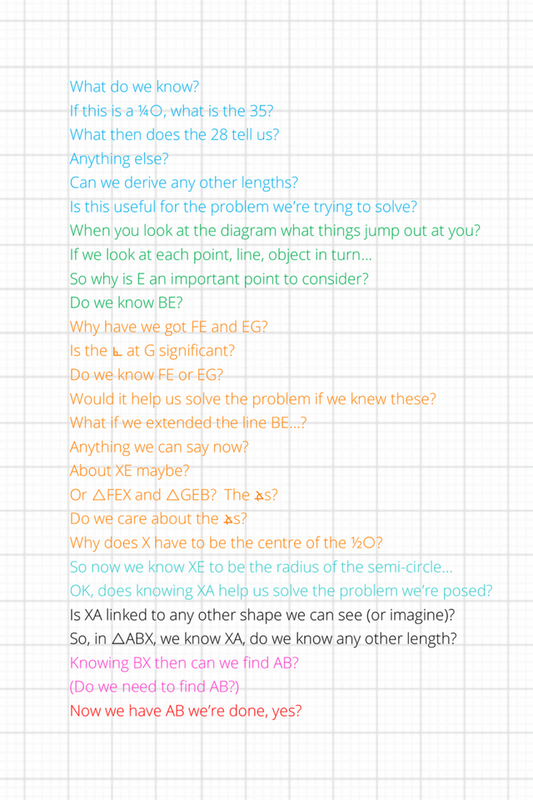 To elaborate, simply doling problems like these out to the dareIsayit more able young mathematicians under our care, as I have seen done, in the name of 'extension', in the mistaken yet often held belief that we are feeding our students' intellectual appetite and that this alone is enough, is, in effect, differentiation's equivalent of a sneaky bag of crisps; the mars bar from the back of the cupboard. Whilst exposure to and engagement with such multi-layered and thus relatively complex activities is unarguably crucial for mathematical maturation, we cannot expect all of our students to become mathematically mature (or, to put it more accurately, mathematically matur-er, matur-ing) simply from exposure to such problems alone. We may not be able — or maybe, moreover, it would be silly and more than unproductive of us to try — to teach students how to be mathematically mature, directly, but we must teach our students the tenets of mathematical maturity, or, rather, we must model for them what it is to be mathematically mature, to behave in a mathematically mature manner when we are befuddled by the beautiful sixes and sevens of uncertainty. Such problems may on the face of it sate a student's appetite for intellectual challenge, initially, but the burgeoning maturation of the budding young mathematician will soon and at best stall — intellectually in nubibus — if s/he is left lingering, frozen in the fathoms of unfamiliarity, dizzied by the bends of conceptual deprivation. And it is not to boot OK to simply show them how it's done afterwards — we need to problematise with and alongside our students, to expose them to the habits of thought, emotional responses and ways of approaching an unfamiliar problem that in essence define what it is to be mathematically mature. Such problems are also often the problems that spike some of the first emotional reactions young secondary students have to an appreciation that no matter how 'clever' they are, how 'clever' they feel they are, or are — or have been — told they are, they still need the support and guidance of someone who knows a bit more. And in the hands of a skilled teacher, these problems can also be one of the first experiences young secondary students have where the surety that you just absolutely know something, that you just know it's right but can't explain it, is — to put it bluntly — no longer good enough. (As Mortimer Adler put it, 'The person who says he knows what he thinks but cannot express it usually does not know what he thinks.') In short, in the right hands these problems are, for the budding young mathematician, potently formative ones, but in the hands of the unthinking, such problems have the potential to do damage, more so perhaps than we may appreciate. 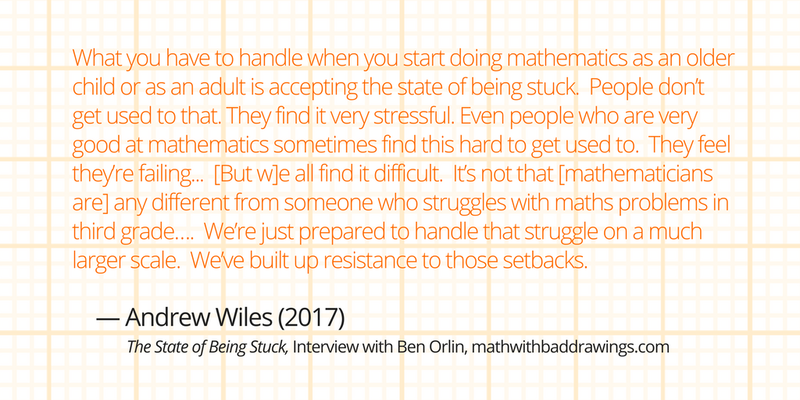 Our planning, thus, is (or should be) about crafting how our students will interact with the problem, and how we will best be able to guide them towards creating their (full) solution, with mathematical — if you like, first principle — integrity. We can do this, the Feynman Imagine stage, by simply visualising talking to a student about / through the problem, akin to visualising moves in a chess game: the moves we plan to make are a function of how we anticipate our opponent(s) will respond. 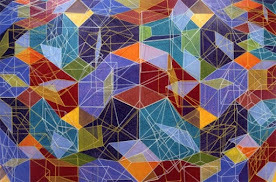 Or, perhaps more pertinently — as we do not expect a problem to respond to our line of attack, as it were, in anything other than a mathematically consistent way — it is perhaps more akin to visualising the moves we would make on a messed up Rubik's cube to get to the most efficient solution. Whilst I am not advocating the scripting of lessons, I am suggesting that a key part of the planning process when addressing and sharing such developmentally potent problems is this cognitive visualisation, scribbled down or not — playing through of the lesson in terms of how students will interact with the problem and how we should want them to. At the same time, I imagine myself talking through the problem with my students (rarely noted down as I have below for the purposes of this post), walking the classroom whilst doing so, noting 'stuff' down, modelling ‘movement’ on the diagram, and anticipating students' responses (or lack of). Questions with 'can', 'what', 'would', and 'is' stems are invariably followed up, where necessary (i.e. if students don't explain themselves fully), with 'how', 'why', 'why not', 'are you sure' and 'what if' stems. Thinking Through the possible question stream. We work through the problem ourselves, careful to cognitively empathise with our students' likely experiences and feelings, even if we devised the problem, and establish a pedagogical narrative. We identify the point in the problem that learning hinges on, and where other segués in learning are most likely to most naturally occur. We then interrogate / test these segués for possible gaps in students' knowledge and/or conceptual 'leaps' that may hinder or undermine learning, and think about what we may need to do to support children through them, whether breaking away from the problem is necessary to develop the knowledge and/or understanding that is as yet insecure or missing, but that is needed if students are to fully engage with the problem. In short, we guide our students' interactions with the problem carefully, sensitively and with intellectual, emotional and pedagogical humility, modelling moreover that it is not just OK to be bedazzled by the shock of complexity and unfamiliarity, that it is not just OK to be stuck — it's actually quite exciting. Adler, M.J. and van Doren, C. (1972). How to Read a Book: The Classic Guide to Intelligent Reading, p411. Touchstone. Chaiklin, S. (2003). 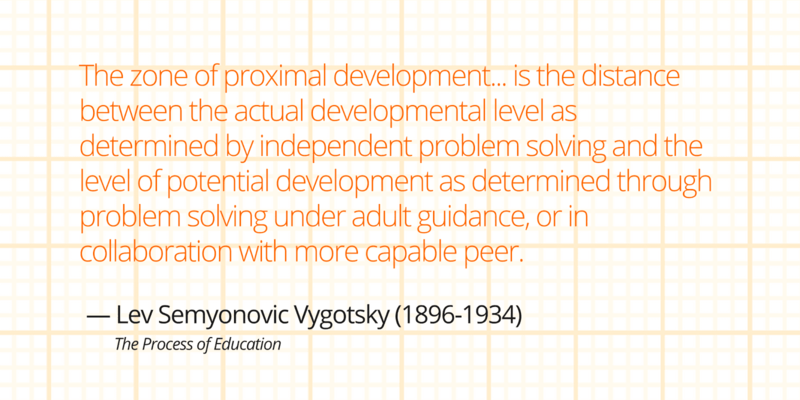 'The Zone of Proximal Development in Vygotsky's analysis of learning and instruction', in Kouzlin, A., Gindis, B., Ageyev, V., and Miller, S. (2003). Vygotsky's Educational Theory and Practice in Cultural Context. Cambridge: Cambridge University Press. Retrieved from http://blogs.ubc.ca/vygotsky/files/2013/11/chaiklin.zpd_.pdf. 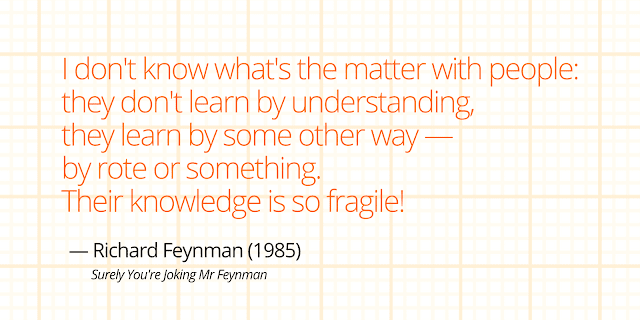 Feynman, R. (1985). Surely You're Joking Mr Feynman! NY: WW Norton. 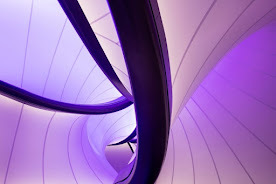 Gleick, J. (1985). Genius: The Life and Science of Richard Feynman. London: Vintage. Golman, R. and Loewenstein, G. (2016). 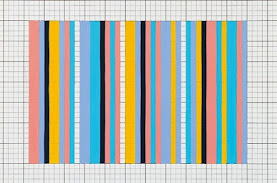 'An Information-Gap Theory of Feelings about Uncertainty.' Retrieved from https://www.cmu.edu/dietrich/sds/docs/golman/Information-Gap%20Theory%202016.pdf .